At thirty-two, Faith Frankel has returned to her claustro-suburban hometown, where she writes institutional thank-you notes for her alma mater. It's a peaceful life, really, and surely with her recent purchase of a sweet bungalow on Turpentine Lane her life is finally on track. Never mind that her fiancé is off on a crowdfunded cross-country walk, too busy to return her texts (but not too busy to post photos of himself with a different woman in every state.) And never mind her witless boss, or a mother who lives too close, or a philandering father who thinks he's Chagall. When she finds some mysterious artifacts in the attic of her new home, she wonders whether anything in her life is as it seems. What good fortune, then, that Faith has found a friend in affable, collegial Nick Franconi, officemate par excellence . . . Quirky, Witty, Effortless. 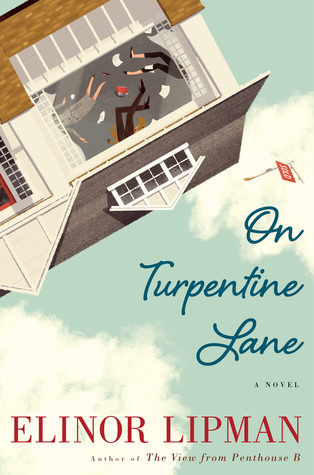 Those are the three words I would use to describe Elinor Lipman's hilarious new novel, On Turpentine Lane. It's quirky because Lipman intertwines romance, murder, high school admissions, and family drama all into one book. It's witty, because the main character and her family had me in stitches from the first page to the last, and it's effortless because Lipman's writing flows so well and makes it seem like writing is the easiest thing in the world! I loved Faith and her family and I can't imagine what it would be like to have such a crazy mom! There are so many fun characters throughout the story that I couldn't pick my favorite if I tried. Each character added something fun and intriguing to the story. Between her job, family, love life, and new house... Faith experienced a lot in just a few hundred pages. There was so much that happened in this story and Lipman tied it all up nicely with a little bow at the end. On Turpentine Lane was a fun, fast paced, and easy read. I thoroughly enjoyed it and love how Lipman shared a lot of humor and fun in the book but didn't drag it on for ages. She got to the point, told a hilarious story, and ended it neatly. I love a good and clean ending! I would highly recommend this book to lovers of Sophie Kinsella and Janet Evanovich. Lipman tells a good story and I hope you all pick up a copy of On Turpentine Lane.